For marketers, social media is becoming increasingly complicated. The number of channels continues to grow and the pressure to show how all this effort will impact the bottom line only grows stronger. The pains of managing social media are obvious – now let’s look at 10 different cures to make those pains disappear. #1: I can’t keep track of what’s going on! Between answering questions on LinkedIn Answers and updating your Ning profile, you missed the fact that one of your customers just wrote a scathing comment on your Facebook page. Cure: Start a social dashboard. Social media management platforms allow you to consolidate multiple social media accounts into one place, so you can manage them all more efficiently. You get an overview of what is happening in different channels, all on one screen. The benefits extend far beyond that, but that’s enough of a reason to look into these solutions. Some solid choices include Hootsuite and Awareness. But different platforms work better for different needs. #2: I’m talking to a bunch of nobodies! You exchange 40 tweets with someone who is knowledgeable about your industry. Great! A real prospect! Then you find out that she is a 20-year-old college student (with 15 Twitter followers) writing a paper – and she has absolutely no ability to make a purchasing decision. You should spend time engaging with people who can move your business forward. That means you need to identify the most influential social media people in your niche. Klout is a tool that tracks influence on Twitter and Facebook. Use it to see if that person is a thought leader, a connector, or a decision-maker. #3: My customers are out there – but where? Tools like Gist put your customers’ email addresses together with their social media identities. You just know that your current customers are on social media. But your Facebook page only has 40 fans. Where are your customers, and how do you connect with them? Cure: Check out your customers’ social profiles. 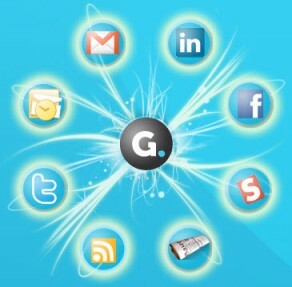 Flowtown and Gist both unify multiple social media presences based on your existing customer email database. This gives you a quick way to find out which of your customers are using different social media platforms, and which customers are influential. #4: I share a lot of content – but it doesn’t drive visits to my site. You’ve seen the recommendations from experts to keep your self-promotion to a minimum. Social media is about sharing. But you’re also accountable for your own metrics. How can you share, and still get people to check you out? Cure: Create social media landing pages. By giving you control of the frame of your link, ObjectiveMarketer gives you the chance to message and brand all of your social media links with customized content. You get all of the benefits of sharing great content with your followers, plus you can show them the interesting things that you’re up to at the same time. #5: I can’t justify all the time it takes to do social right! Your team spends hours each week retweeting, sharing links and joining the conversation. But now it’s the end of the year, and you need to make a budget for next year. You know you can’t go on with such a long to-do list, but you don’t have the metrics to show the impact. Cure: Use your existing metrics – just show the social benefit. Argyle Social tracks the response from your social media updates and maps them back to the conversion metrics you set up on your website. And it looks back up to 90 days in order to account for a longer consideration cycle – showing how a bunch of tweets adds up to an eventual sale. Argyle Social tracks the social media links you share and maps that activity back to your website conversions. #6: I don’t know what my followers are doing online! You see what happens to your own status updates and blog posts – visitors come to your site, readers leave comments, etc. But you have no idea what they’re doing on the rest of the web. Cure: Tell people what you like to find out what they like. This is one place where the biggest names in social media can help you. Twitter and Facebook offer login credentials that any website can adopt (there are open source alternatives as well). Whenever possible, you should connect to other sites using one of these login protocols and “Like” content across the web liberally. Often, you can see who else in your network is also interested in that website. In this way, you’ve created a new opportunity for engagement. Facebook “Likes” are a great way to find out what your fans are interested in from across the web. 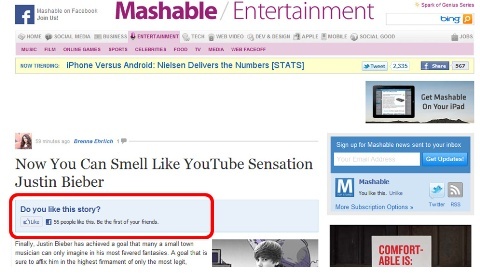 “Like” the content you find as you browse, and you’ll see what your fans like in return. #7: I can’t filter out the noise from the important stuff. Every time you login to Twitter, you see that there are thousands of unread tweets. Your Facebook page is overrun with comments from people you’ve never heard from before. And there are 1,575 blog posts that are ready for a comment from you. Cure: Get information fast – when you need it. Cadmus can definitely help in this arena. It’s designed to show you the most important tweets from your network. If you’re looking for information from your network on a specific topic, Nsyght searches across your social network. It’s like Google but only for the people in your social network. #8: All this engagement isn’t leading to anything! You get retweeted by the same people over and over. You have the same conversation with multiple followers. 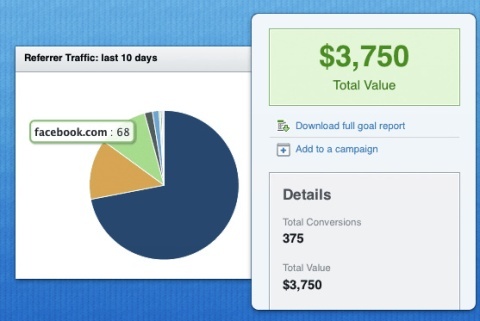 You’re running in a hamster wheel, not moving your marketing forward. Cure: Get yourself some game mechanics. Game mechanics means linking your marketing efforts together, so that one interaction naturally leads to the next. You have to create a series of social media events that encourage your followers to engage more deeply – and game mechanics provide a solid framework for planning. #9: There are not enough hours in the day! As soon as you feel like your Facebook presence is strong, you know you need to create a SlideShare presence. There’s always one more tweet to write, one more blog post to comment on and new marketing campaign to support. Cure: Make the case for dedicated resources. Your marketing program needs to evolve, or it will die. That means your team needs new skills, and a more sophisticated understanding of social media. Work internally to make the case, based on your current success, to shift marketing dollars into social media. And make sure you find the people, whether internal or external, who can hit the ground running. #10: I have all this content, but I don’t know what to do with it. You’re doing a great job of engaging with your audience. They’re responding and you have some great quotes. But you’re not getting the full marketing benefit from this engagement. Cure: Create a space on your site to feature the best social content. Assuming that marketing involves bringing people to your site so they can take some action, you should feature some social content from your community on your site. This gives your best followers a pat on the back, and allows others to brag about you so you don’t have to. Testimonial pages are a great way to do just that. What are your biggest social media pains? The community just might be able to cure them for you. If you’ve figured out how to cure them already, be sure to share your solutions in the comments box below. Jamie Beckland creates social and emerging media programs for White Horse, a digital marketing agency, and has built online communities since 2004.